Taking a post-workout plunge in an ice water bath is a common practice among many athletes. Known as cold water immersion or cryotherapy, it is used to recover faster and reduce muscle pain and soreness after intense training sessions or competitions. In addition to the ice bath, some athletes use and contrast water therapy (alternating between cold water and warmer water) to get the same effect. 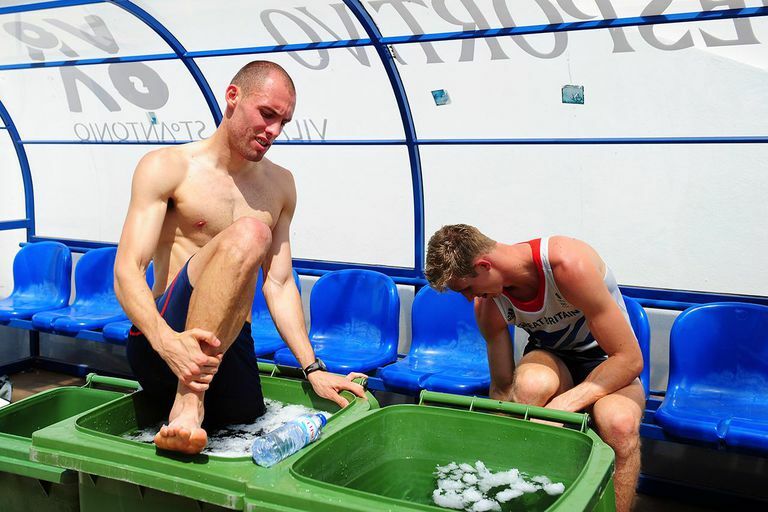 From elite runners to many professional rugby and football players, the post-workout ice bath is a common practice routine. Like many practices, it's good to question whether this works. See what research says about the pros and cons of cold-water immersion or contrast water therapy after exercise. The theory behind ice baths is related to the fact that intense exercise causes microtrauma, which is tiny tears in your muscle fibers. This microscopic muscle damage is actually a goal of exercise as it stimulates muscle cell activity and helps repair the damage and strengthen the muscles (muscle hypertrophy). But it is also linked with delayed onset muscle pain and soreness (DOMS), which occurs between 24 and 72 hours after exercise. Then, with rewarming, the increased blood flow was believed to speed up circulation, and in turn, improve the healing process. Although there is no current protocol regarding the ideal time and temperature for cold immersion routines, most athletes or trainers who use them recommend a water temperature between 54 to 59 degrees Fahrenheit (12 to 15 degrees Celsius) and immersion times of five to 10 minutes, and sometimes up to 20 minutes. While that’s the theory behind the cold water immersion for exercise recovery, conclusive research about the pros, cons and ideal time and temperatures is still a ways off. Of the studies that have looked at the effects of ice baths, cold water immersion and contrast water therapy on exercise recovery and muscle soreness, most offer inconclusive or contradictory findings. Research suggests that icing muscles immediately after maximal exercise suppresses inflammation, hinders muscle fiber growth, and delays muscle regeneration. This would be bad news for athletes who are trying to increase muscle size and strength. A Cochrane review of 17 studies concluded there was some evidence that cold-water immersion reduced delayed onset muscle soreness when it was compared to rest or no intervention. There wasn't enough evidence to conclude whether or not it improved fatigue or recovery. The most effects were seen in studies of running. All of the studies were of low quality and didn't have a standard for adverse effects or follow up with the participants actively. Contrast water therapy was shown by a review of 13 studies to have some evidence that it was better at reducing exercise-induced muscle soreness recovery than passive recovery or rest, but the difference was minimal. There was no difference in muscle soreness between contrast water therapy, cold water immersion, active recovery, compression, or stretching. Active recovery is generally still accepted as the gold standard, and arguably, the best way to recovery after hard exercise. Cold water immersion after a single hard workout offers some temporary pain relief and may, in fact, help recovery—at least an athlete's perceived experience of a faster recovery. Alternating cold water and warm water baths (contrast water therapy), may help athletes feel better and offer temporary pain relief. Ice baths are not necessary. Cold water baths (75 degrees Fahrenheit or 24 degrees Celsius) are as good, and perhaps better, than ice baths. Passive recovery (complete rest) is not an effective way to recover. Hot baths after hard exercise may hinder exercise recovery. If you are going to try cool or cold water immersion after exercise, don't overdo it. One review of studies found the best routine was 11 to 15 minutes of immersion at a temperature between 52 and 60 degrees Fahrenheit (11 to 15 degrees Celsius. That should be enough time to get the benefit and avoid the risks. Because cold can make muscles tense and stiff, it's a good idea to fully warm up about 30 to 60 minutes later with a warm shower or a hot drink. If you prefer alternating hot and cold baths, the most common method includes one minute in a cold tub of 50 to 60 degrees Fahrenheit (10 to 15 degrees Celsius) and two minutes a hot tub of 99 to 104 degrees Fahrenheit (37 to 40 degrees Celsius), repeated about three times. Whether the science supports the ice bath theory or not, many athletes swear that an ice bath after intense training helps them recover faster, prevent injury, and just feel better. You can give this a try to see if it works for you. But if you decide you don't like it, feel free to skip it the next time. Bieuzen F, Bleakley CM, Costello JT. Contrast Water Therapy and Exercise Induced Muscle Damage: A Systematic Review and Meta-Analysis. Hug F, ed. PLoS ONE. 2013;8(4):e62356. doi:10.1371/journal.pone.0062356. Bleakley C, Mcdonough S, Gardner E, Baxter GD, Hopkins JT, Davison GW. Cold-Water Immersion (Cryotherapy) for Preventing and Treating Muscle Soreness After Exercise. Cochrane Database of Systematic Reviews. 2012. doi:10.1002/14651858.cd008262.pub2. Machado AF, Ferreira PH, Micheletti JK, et al. Can Water Temperature and Immersion Time Influence the Effect of Cold Water Immersion on Muscle Soreness? A Systematic Review and Meta-Analysis. Sports Medicine (Auckland, N.z). 2016;46:503-514. doi:10.1007/s40279-015-0431-7. Roberts LA, Raastad T, Markworth JF, et al. Post-Exercise Cold Water Immersion Attenuates Acute Anabolic Signalling and Long-Term Adaptations in Muscle to Strength Training. The Journal of Physiology. 2015;593(Pt 18):4285-4301. doi:10.1113/JP270570.